GBPUSD is moving in the lowest levels since the beginning of this year. Later today, Gfk Consumer Confidence will be released while Brexit issue is still being discussed. 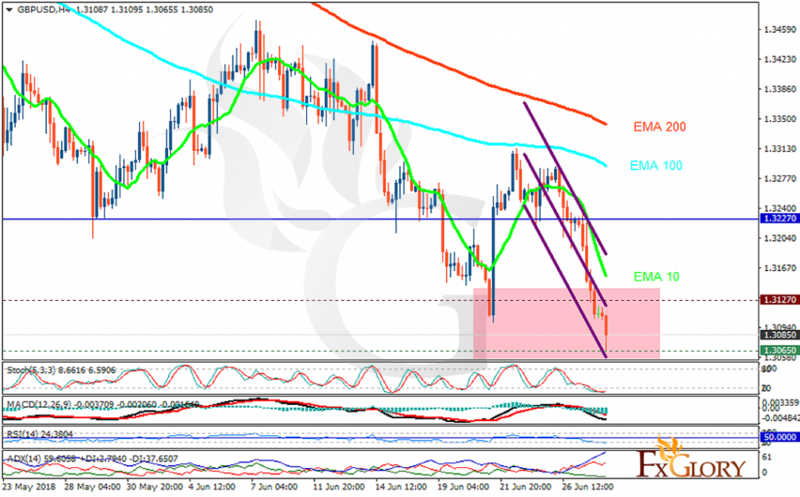 The support rests at 1.30650 with resistance at 1.31270 which both lines are below the weekly pivot point at 1.32270. The EMA of 10 is moving with bearish bias in the descendant channel and it is below the EMA of 200 and the EMA of 100. The RSI is moving in oversold area, the Stochastic is moving in low ranges and MACD line is below the signal line in the negative territory. The ADX is showing sell signal. The price may fall towards 1.30 which will be the lowest rate since the last year.